Broadsword by definition is a sword with a broad blade and at times with two cutting edges. It is used to cut rather than stab – perhaps to inflict torture on a poor soul as opposed to put them out of their misery. This eerie feeling emanates as the play Broadsword opens at the Adrienne Arsht Center. The Arsht Center and Mad Cat Theatre Company partner up for the first time to present the play written by Miami-native Marco Ramirez going on now through May 9 at the Carnival Studio Theater in the Ziff Ballet Opera House. This work has been nominated for five Carbonell Awards and since has been highlighted as a staged reading at The John F. Kennedy Center for the Performing Arts in Washington, DC, and a workshop production at the Juilliard School in NY. 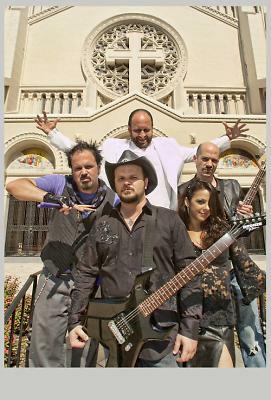 Originally performed as a workshop production in Miami in 2009, Broadsword, is the fictional story of a New Jersey-based metal band (by the same name of the play itself) that never made it big. After breaking up 16 years ago, their former lead guitarist, Richie, has gone missing. Now the defunct band’s remaining members meet for the first time since the break up, at what is believed to be Richie’s funeral. Director Paul Tei (Mad Cat), who has graced the GablesStage among others, additionally plays Nicky the drummer. Broadsword band members are also Tony (Erik Fabregat) and bassist Victor (Eli Peck who replaces Todd Allen Durkin). One time groupie and friend, Becca (Sofia Citarella), joins in on the melancholy raucous that has brought them all back together. The part of Dr. Thorne (Ken Clement) and The Man in White (Gregg Weiner) makes for a funky ride. Dr. Thorne is a musicologist whom had correspondence with Richie before his untimely departure. The Man in White is interchangeable with the devil that tempts with promises of musical glory. They both hold the key to Richie’s disappearance. The narration of Broadsword consists of Richie himself and a local Jersey radio vee-jay. It sets the somber mood and intertwines sections of the theatrical work to make it appear seamless. Broadsword’s set makes for a believable basement where rock n’ roll dreams once thrived. Old music tapes, family trinkets and stellar music gear adorn the deceased’s once home. Music tracks weave into the play as scenes change. 80’s hits by Metallica and ACDC take the audience back about 30 years via a melodic time warp. The play’s lighting helps to create a downhearted mood – with spotlights and dimming effects bringing forth the unresolved issues each character holds. All of the actors perform well and stay at a level where one does not outshine the others. They, in essence, are playing the “regular Joe” that fits the mold of this New Jersey rock story. A final concert, almost in tribute to Richie’s memory, takes your heart and softens it with a single drum blow or guitar strum. Sweet sadness falls from Broadsword’s musical notes. Tickets are $35, and may be purchased through the Adrienne Arsht Center box office at (305) 949-6722 or online at http://www.arshtcenter.org.